[prMac.com] Fremont, California - FmPro Migrator Platinum Edition 6.00 adds automated FileMaker Pro to PHP conversion feature. FileMaker Developers can use FileMaker Pro Advanced and FmPro Migrator Platinum Edition as a rapid application development environment for quickly prototyping PHP web applications. The PHP Conversion feature built into FmPro Migrator Platinum Edition provides an automated FileMaker Pro to CakePHP web application conversion feature. This feature includes the conversion of layouts, scripts, relationships, tab controls, portals, charts and value lists. The converted PHP web application uses the contents of existing layouts to build dynamic web forms having insert, query, update and delete features, supporting 12 database servers. Almost all layout objects are converted, including: charts, image fields, tab controls, custom value list menus, field-based value list menus (single and dual field), checkboxes, radio buttons and vector graphic objects (rectangle, rounded rectangle, oval/circle). * Layout to PHP Web Form Conversion - The converted FileMaker Pro layouts have the same graphical look as the original layouts, but are implemented using the latest popular web development plug-ins and frameworks. Some of these web frameworks include: pChart, Fusion Charts, jqGrid, jquery.datepicker.js, jquery.gritter.js, Adobe Spry TabbeedPanels, raphael.js, jquery, CakePHP. * FileMaker 11 to pChart Chart Conversion - FileMaker 11 charts can be converted into pChart server-side PHP charts. By default, the generated charts are rendered and displayed in real-time within the web browser web page. Alternately, the pChart charts can be rendered to a PNG image on the web server for use on high traffic web sites. Either way, the generated charts will look identical when displayed on any web browser or mobile device. 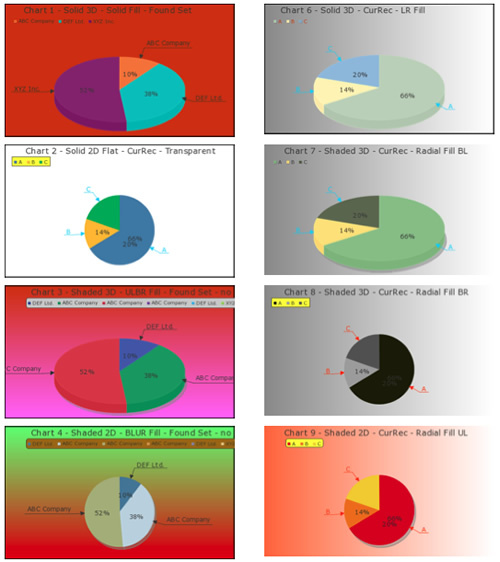 The generated charts use the original FileMaker color scheme, retrieved from the layout object. Each FileMaker color scheme has been designed as a pChart color palette file, stored within the pChart directory created by FmPro Migrator. Additional changes can be made to the generated PHP code to implement additional types of charts which are not natively implemented in FileMaker 11. * Portal to jqGrid Conversion - FileMaker portals are converted into grid objects using the jQuery jqGrid PHP library. The jqGrid is a high performance PHP grid providing the capability of handling millions of records thru a direct connection to supported SQL database servers. Grids displayed on edit forms provide record editing capabilities, including record insert, update and delete features. Grids displayed on view and edit forms provide record searching, refresh and export features. The record export feature provides exporting of related records as PDF, Excel and CSV files using the toolbar icons. * Static and Dynamic Value Lists - Static and Dynamic value lists are converted into PHP code within the app_controller.php file. Individual value list functions are only executed if they are used on a particular form, in order to improve performance. * Checkbox and Radio Button Groups - Radio buttons and checkboxes are implemented to use either static or dynamic value lists as they were configured on the original layout. Radio Buttons and Checkboxes which are taller than 20 pixels, will be created as vertically oriented objects with an HTML "<br/>" tag separating each value. This feature can be easily changed within the controller code for the view. * Tab Controls - Tab Controls are converted into Adobe Spry TabbedPanels, including all embedded objects. Embedded Tab Controls are processed recursively any number of levels deep. * Record Navigation Buttons - Button and image objects which are bound to Goto Record navigation script steps (First, Previous, Next, Last) are converted into PHP record navigation code. * Gritter Dialogs - The jquery.gritter.js plug-in provides a professional looking non-modal alert dialog box for web applications. The dialog looks similar to a MacOS X Growl alert dialog - however it is cross-platform and cross-browser compatible. This plug-in is fully integrated into the generated web application wherever flash messages are sent from within controller code. * Jquery Date Picker - The jquery.datePicker.js plug-in is enabled for each field on the form which was configured with a calendar picker on the original FileMaker layout. The styling of the datePicker can be configured site-wide thru making changes to its .css file within the webroot/css/jquery directory. * Query By Example Database Searches - Each converted layout includes query and querylist view files to provide query by example processing. Fields, menus, radio button groups and checkboxes can be used when submitting the query request. * Sophisticated Web Application Features Implemented Automatically - The generated PHP web application includes professional looking features to your PHP web application automatically. Some of these features like the Grid or chart objects might require dozens of hours of work to add to your project manually. The implementation of the Gritter feature provides professional looking Info or Error dialogs which can have a timed fadeout feature, similar to MacOS X Growl dialogs. Vector graphic objects implemented via the RaphaelJS library provide high quality vector graphic object drawing of objects which look good at any screen resolution, to match the look of the original FileMaker Pro layout objects. * FileMaker Script to PHP Conversion - ach FileMaker Pro script and Custom Function is converted into a separate PHP code file within the application directory. These scripts are intended to be used as a starting point for further development by an experienced PHP developer. FmPro Migrator Platinum Edition is priced at ($600) per developer and includes a copy of FmPro Migrator Platinum Edition for both MacOS X (Universal Binary) and Windows platforms. Existing FmPro Migrator Developer Edition customers may upgrade to FmPro Migrator Platinum Edition for $400. .com Solutions Inc. develops multi-platform graphical applications supporting FileMaker Pro, Bento, SQLite, Oracle, MySQL, Access, SQL Server, Sybase, DB2, OpenBase, PostgreSQL, FrontBase, Valentina, LiveCode and Servoy developers. FmPro Script Diff, compares and edits FileMaker Pro scripts. FmPro Migrator converts FileMaker Pro databases to and from FileMaker Pro, SQLite Diff compares SQLite database schema and data. Servoy is a trademark of Servoy, Inc., registered in the U.S. and other countries.